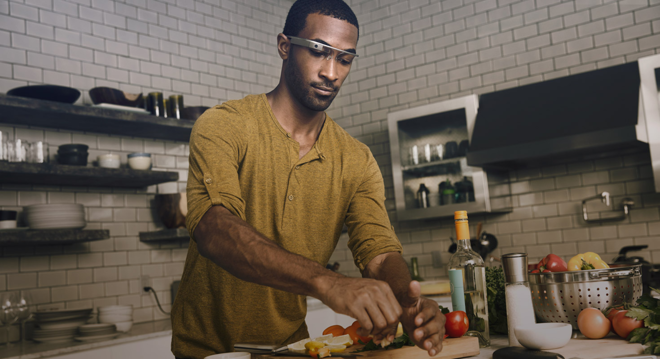 The somewhat awkward positioning of the display in Google's head-worn mobile device dubbed Glass has been shown to cause eye muscle fatigue and headaches in some early adopters, leading at least one evangelist to suggest that the product should come with a warning label. Much of the problem stems from users who are unaccustomed to looking upward for long periods of time, Harvard optometrist Dr. Eli Peli told BetaBeat. Google brought Dr. Peli in as a consultant when issues began to arise. "The only people who look up a lot are some professionals like electricians and painters," Dr. Peli said. "Most of us look either straight or down. It's well known that up is less comfortable." "It's not a headache, it's sort of a discomfort in the eye muscles," he added. "To describe it as a headache is inconsistent with how people experience headaches." Both Dr. Peli and Google suggest that pain can be alleviated by using Glass for shorter periods of time, especially in the beginning before users' eyes have had a chance to adjust to looking repeatedly in Glass's direction. Google likened it to the adjustment period that many people experience with a new pair of prescription eyeglasses and said that the eyewear was "designed for micro-interactions, not for staring into the screen, watching Friday night movie marathons or reading 'War and Peace.'" As noted by BetaBeat, early Glass evangelist Chris Barrett told CNET that he believes "there should be a warning that comes with Glass; that if you start to get a headache, you should limit your use." Barrett has since abandoned Glass due to the pain.